Kimchi has been on our “to try” list for just about a year now. Every time we’re in the grocery store, we roll past it and say, “we really need to think of a way to use kimchi,” before wussing out and rolling right on past it again. We’ve always been intimidated by it because people seem to have a love/hate relationship with it, and who wants to buy a jar of something that after one bite you completely hate? For those of you who are unfamiliar with kimchi, I’ll give you a little background. Kimchi (also called gimchi and kimchee) is a traditional Korean vegetable side dish made of fermented seasoned cabbage (usually Napa) and sometimes other vegetables. It is usually fermented in brine with garlic, scallions and ground pepper, but there are other variations that typically vary by seasonal availability. Anyway, we bit the bullet last week and picked up a jar. In the store, we were feeling confident, assured that kimchi would soon be our new favorite staple and that we would love it with and on everything. Our new-found confidence was quickly deflated when we pulled into the checkout line. 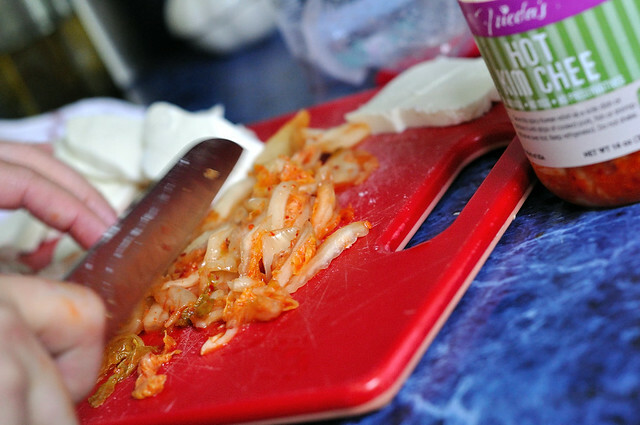 We’ve made two dishes with kimchi so far and have loved them both. 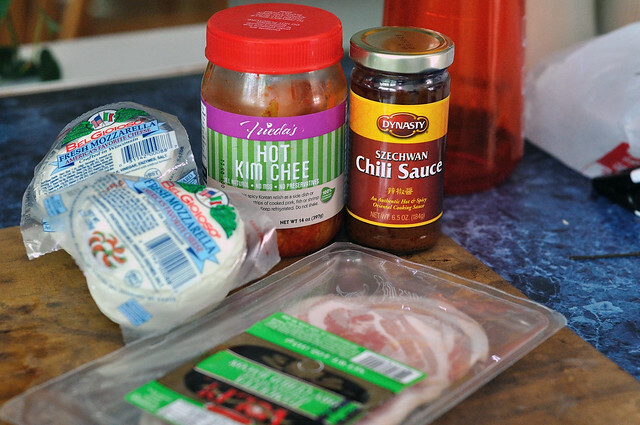 It is an acquired taste, but if you pair your ingredients right, kimchi is the perfect complement to so many things. We included it first in a batch of beer-breaded fish tacos (recipe coming tomorrow!) and for the past two nights have made two thin crust pizzas, using it as a toppings. 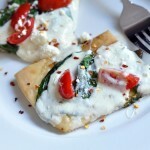 The trick seems to be pairing it with something creamy, salty or spicy. 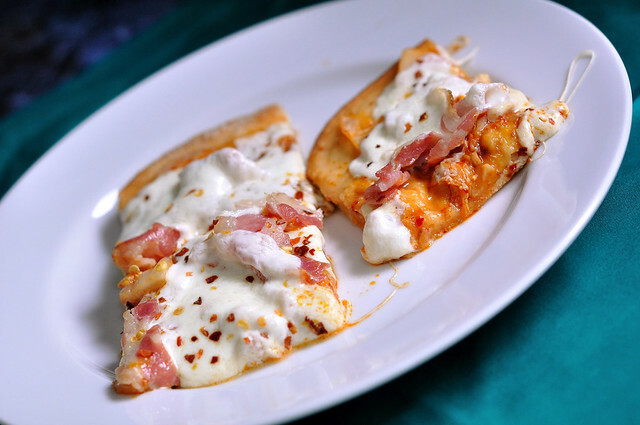 In the case of our pizza, we paired with prosciutto and fresh mozzarella cheese with a spicy pseudo-Asian barbecue sauce. Our dough. 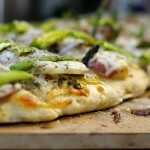 I’m so in love with this recipe, I’ve really never had one better outside of a restaurant crust, but they have the unfair advantage of a wood-burning oven. The sauce. It’s so good. It’s got a super warm, smoky flavor, but with the hint of sesame, it tastes like a lighter, asian spin on barbecue sauce. I’m also pretty sure Neil added a squirt of sriracha to it, as if it weren’t spicy enough on it’s own! Neil’s pizza topping prep “tray,” replete with prosciutto, mozzarella, and kimchi. Ready for the oven. Can you spot where I took a bite out of the mozzarella? I claimed my part of the pizza, the dirty, totally unsanitary way. Good thing I was only sharing with Neil. Fresh out of the oven. 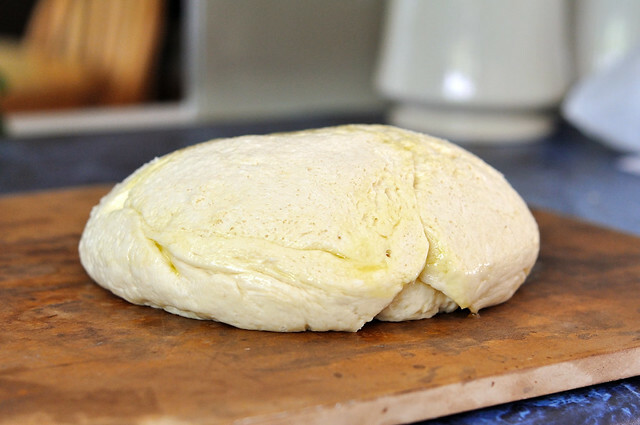 I just love the way fresh mozz melts. It smelled so good! 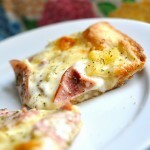 I could have sliced the pizza more traditionally, but Neil and I both like our pizza squared. Is that weird? Place oven rack in the lower middle position and place pizza stone/baking sheet on the rack and preheat oven to 475 degrees F.
For the dough: Follow the preparation/assembly directions for our Perfect Thin and Crispy Pizza Crust. You can opt to freeze or not depending on your time constraints and preferences. 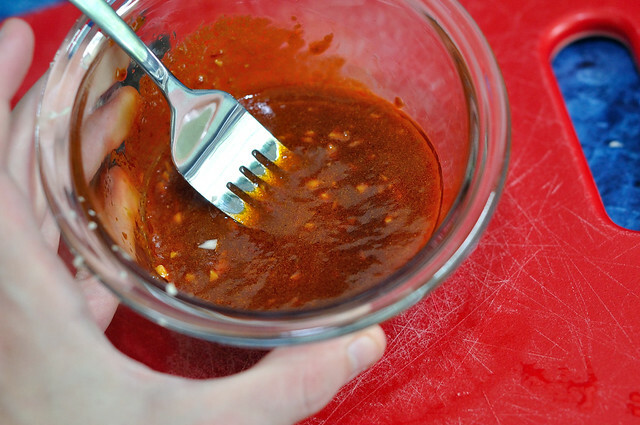 To make the sauce: Mix the Chings Schezwan Stir Fry Sauce with the kimchi juice, stir, and add the sesame oil, garlic and sesame seeds and stir again to combine. 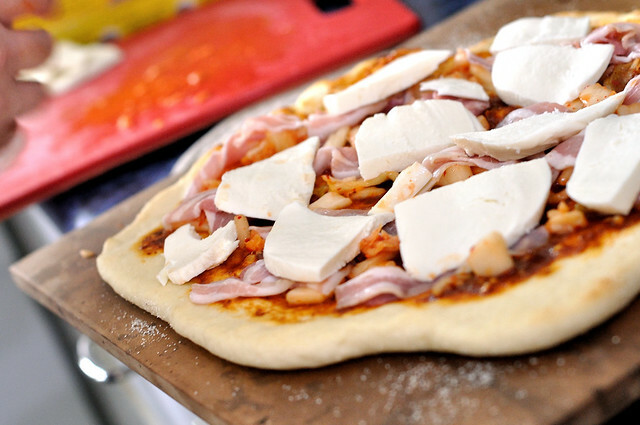 Once dough has finished it’s pre-bake (see directions in step 2), spread sauce on dough and top with chopped kimchi, proscuitto, and mozzarella. Bake again for 10-12 minutes and cool for 2-3 minutes before slicing. 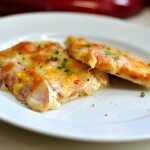 Top with red pepper flakes or parmesan cheese if desired. Yum! 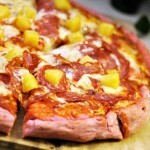 It’s like spicy Asian barbecue pizza. Nice and light, super crunchy and full of amazing flavor. The kimchi is a perfect compliment to the cheese and prosciutto, and the spicy smoky flavor of the sauce really brings everything together. If you’re new to kimchi, and a little “eh” to the idea of fermented cabbage, this is the perfect introductory recipe. Enjoy! Interesting stuff. And I like Belgioso okay but have you tried Schnucks’ store-made mozz? It may be a bit salty to go with prosciutto and kimchi, but it’s excellent. Hmm, we’ll have to try it. We’ve been going to Schnucks almost exclusively since we move, and they have such a nice cheese selection that it’s easy to overlook the simple store brand, but we’ll definitely give it a try next time! “I see you have some Lean Cuisine in your cart, ever look at the sodium content? GROSS!” – Nice. In the sauce, do you grind up the tablespoons or toss them in whole? Plastic or metal? Your recipe doesn’t specify. My bad, that’s where I started writing the stir fry sauce there, and then got caught up at work and retyped afterward. As always, thanks for pointing out the mistakes! 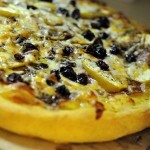 I want to try the pizza dough recipe; I’ve tried a few and I’ve gotten close to the right one, maybe this is it! 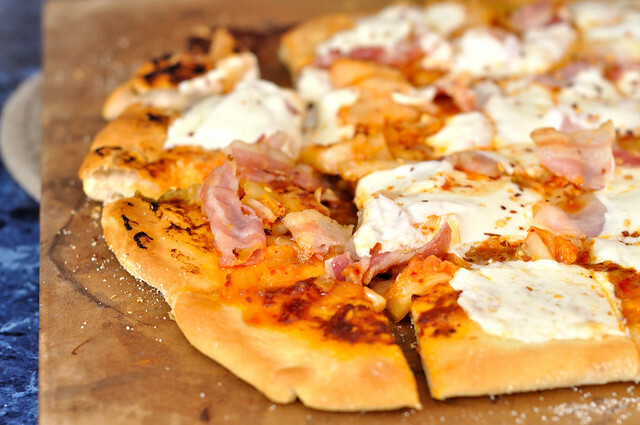 I agree, nothing is better than fresh mozzarella on a pizza. I buy the bulk pack at Sam’s that’s presliced because I am usually in a hurry. I’m sure Luke would love this pizza! 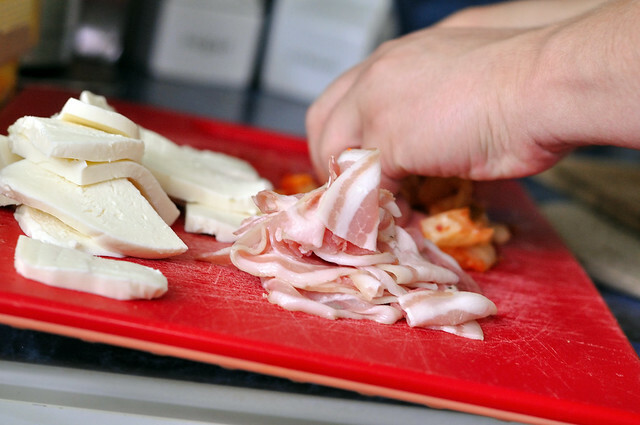 In your photos, your prosciutto really appears to be pancetta.